Sometimes you want to add more information for taxonomies (category, tags, or any custom taxonomies) in WordPress, like category icon, age (for “people” taxonomy), something like custom fields for posts. But sadly WordPress doesn’t have custom fields for taxonomies. This is the reason I created this script. Taxonomy Meta Script is based on Meta Box Script, so you’ll find they’re very similar in using and developing. It works with custom taxonomies and supports various field types that Meta Box Script supports. So, if you’re interested in the script, you can visit the project page to download. The instruction is also there. Hope that it’s clear enough for you to implement the script! By the way, the Meta Box Script is updated to version 3.1, in which some bugs are fixed and the image uploading functionality is improved. I want to give a big thanks to Johann Kratzik, who suggested the idea of the script! Hi! Great script, but something weird is happening when I try to add an meta box type image to custom taxonomy – every time I press Update to the taxonomy, All images dubles its count! This is insane 🙂 Can you please, help with this. Hi! Do you plan to make some changes regarding my previous comment or I have to look at other solutions? Hi jam, sorry for late reply. I’m too busy but I’ll look at the problem you said. Thanks. Ok. No problem (actually it is). There is another one screenshot of both problems. http://i.imgur.com/ByJKs.png Dublicating images and also dublicating image sets. Dear Tran, when you would find a free time to take a look at this problem with your plugin? Hi jam, I’ve just tested the script again to mimic your situation, but it seemed to work well. Here’s my screenshot: . I’m using TwentyEleven theme to test. 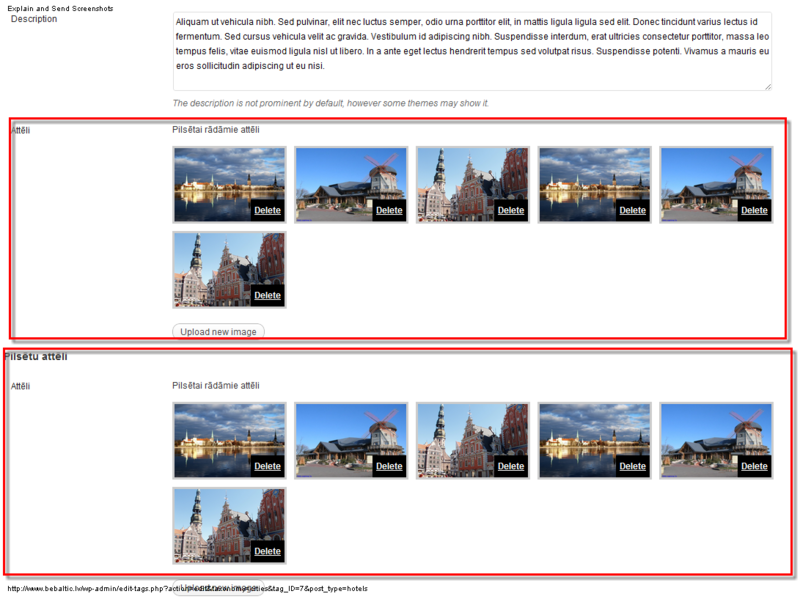 If you try to press Save, to taxonomy term, the images no becoming double?? Yes, exactly, no double. The screenshot I made after I saved the category. What could bring me to such problem I have? I figured out, what brings me to this problem. It is WPML multilanguage, dammit, plugin!